All faith in the great Michelin Guide has now been restored to me thanks to the talents of Frenchman, Alexis Gauthier. The last Michelin started restaurant I visited left me so angry and disappointed that I had frankly lost all faith in the guide and haven’t blogged since, because every time I log in I see this half finished entry that’s been there since January. Last Monday night I treated a couple of friends to dinner at Gauthier. I booked it arranged payment etc then got dragged along with them, I know I know, I had to have my arm seriously twisted! Thankfully it was a Monday night so they were able to squeeze us in, the private dining cellar room no less! We had booked on the tasting menu; 8 courses of exquisite loveliness. Now, a quick word to the wise, if you’re going for a tasting menu on a Monday night, book a table earlier than 8pm, it was around midnight when we left, fine for a Friday – but on a school night, I felt pretty fluffy as I began this entry on the way to work on Tuesday morning. As I perused the wine list two things became abundantly clear to me 1) it is surprisingly good value, plenty of bottles under £30 and 2) I was going to need some help. The restaurant manager, under my extemely specific directions of “one medium ish red, one white (not too fruity), both to be French and around £25-£30” picked 2 stunning bottles! I think my guests were impressed! All the food was just incredible, course after course of divine decadence. It was kicked off with the naughty but nice duck foie gras that was perfectly cooked, with a little colour on the outside. I think there had been some duck fat in the pan it was cooked in as there was a hint of that unmistakeable yummy duck fat flavour. Next came the scallop – now, anyone who’s been out for dinner with me will know that a dish with truffles or scallops will usually get my vote, this was beautiful, the scallop was plump, soft and just oozed that sweet unctuousness that only the finest scallops have, greedy old me would have loved two scallops, but then one isn’t used to tasting menus so I wouldn’t have made it through the rest of the menu. I always tend to go a little overboard when describing a truffle dish, I think this used to be because I felt that a dish that expensive deserved an essay, but now it is genuine excitement, I can’t get enough of the things, I have once or twice been caught in the kitchen quietly taking a sniff from the bottle of White truffle oil I can’t seem to live without. 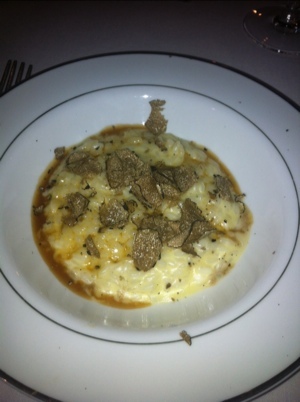 So, as if I needed to say it, the next course was Summer truffle risotto. Wonderful, rich, decadent with a liberal dusting of wafer thin summer truffle slices and a drizzle of brown butter – ‘mazing. The bigger courses were next, sea bass with squid and tempura courgettes, a lovely dish, although I did feel the sea bass was a little overcooked, but I am no expert on sea bass having never actually eaten it before, it just didn’t seem to fall apart like other white fish – if I am wrong, please do correct me. Pork belly, with a crispy sticky skin was really good, it was a little more substantial than either dishes but it wasn’t too big that we were full either, the flavour of the pork and the tartness of the cherry jam were a perfect match. One of the desserts was possibly the richest poshest chocolate pudding I have ever eaten! It’s got crunchiness, divine praline and is coated with a generous layer of chocolate ganache. 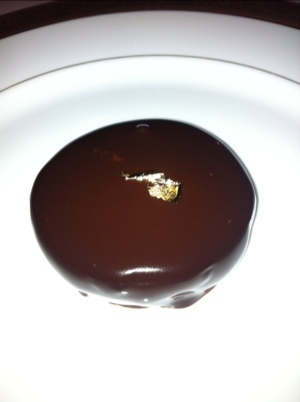 Oh and there was a bit of gold leaf on top… The word decadence, doesn’t really begin to describe this dessert and I couldn’t do it justice, so you’ll just have to book in and taste it for yourself. At £70 per person for the tasting menu the bill really was pretty reasonable. It was a little over my usual style of Monday night restaurant bill but the. I don’t dine at Michelin starred restaurants every Monday! In my opinion it was worth it! For me, Michelin dining is as much about the service as well as the food. 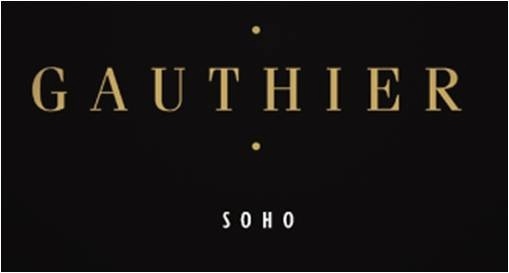 Gauthier has got both down to a fine art, a near perfect menu and subtle service. The staff training here must be pretty rigorous, but it pays off; the knowledge, care and attention to detail from all departments really shone through and made our evening so special. Please excuse my terrible photos, I was only using my phone and they looked a lot better when I was 3 glasses of wine – I’m seriously out of practice on the blogging lark! Sounds like a minefield for the sommelier! Did you note the wines he recommended? White: something high acidity like Chablis or even a young riesling? Red: something that will complement the pork but hold its own before the choccy, beaujolais?